Last attempt, hopefully! I added both lines, and used Gotham for both of them. Thanks for dealing with my nitpickyness. I think we’re about there. The small text font seemed even smaller than before. I had to make it bigger - it just wasn’t defined enough. I found the Gotham font online and installed it, so the font at least matches. I got some thicker 1/8" rubber today, I have a feeling that the 1/16" stuff I’ve been using doesn’t have enough “give”. 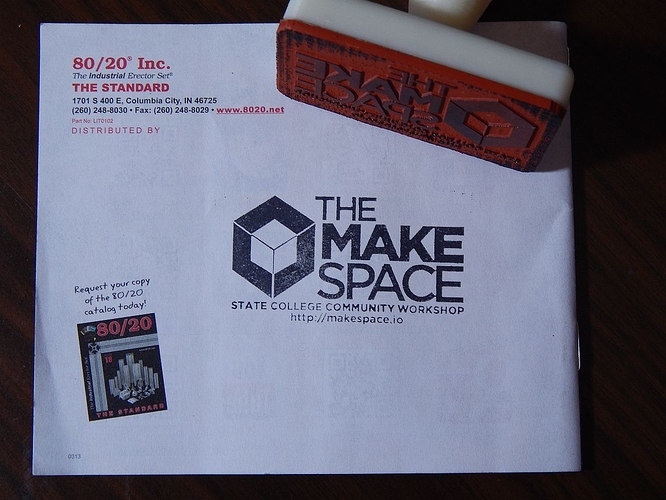 The stamp handle was whipped up in DesignSpark Mechanical in about a half hour. I’m really starting to like this free 3D CAD software. OK, I redid this one more time with 1/8" rubber instead of 1/16" I also engraved it deeper. It really didn’t seem to improve it much. 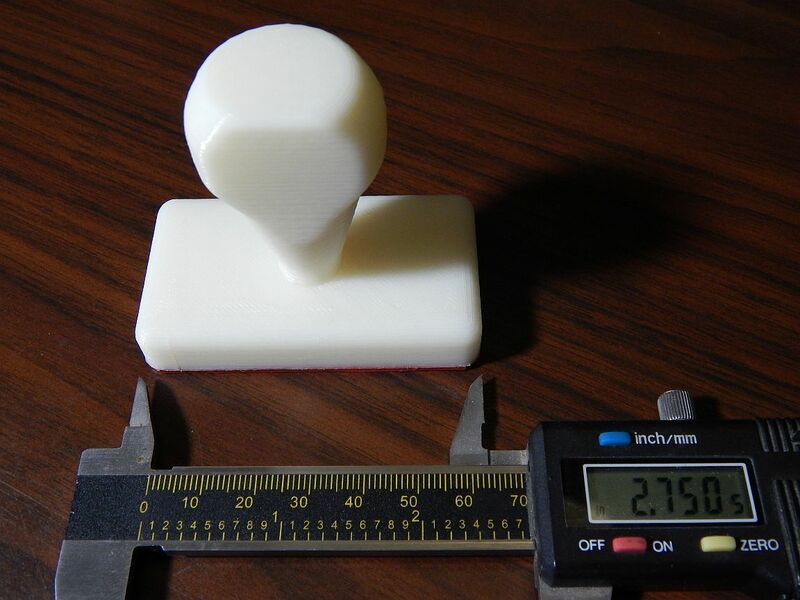 The thinner rubber might have actually been more sharp. I’m calling it done for now. I’ll bring the stamp in next week and somebody can stamp all those Bitcoin pamphlets and start placing them around town. Looks great. Thank you for your effort. This really adds an extra layer of professionalism to the group. It turns out that the rubber stamp works great on regular paper, but not so good on the glossy paper that the bigfoot bitcoin pamphlets are printed on. The rubber on the stamp is also very smooth, and the ink acts as a lubricant when trying to stamp the pamphlets. It’s very difficult to keep the stamp from sliding when stamping. My though is to try sanding the rubber lightly with 400 or 600 grit sandpaper to see if that helps. I took it back home and will do some more experiments to try to get it working better on the glossy paper. Weird that the ink slides. Does it only slide on the bitcoin pamphlets, or does it also slide on normal office paper? If it does that, maybe a better ink pad would help. The bitcoin pamphlets also recommend a specific Avery size label, and I wonder if we shouldn’t just get those anyway. We can still stamp our information on those. It only slides on the Bitcoin pamphlets. The paper is super glossy. 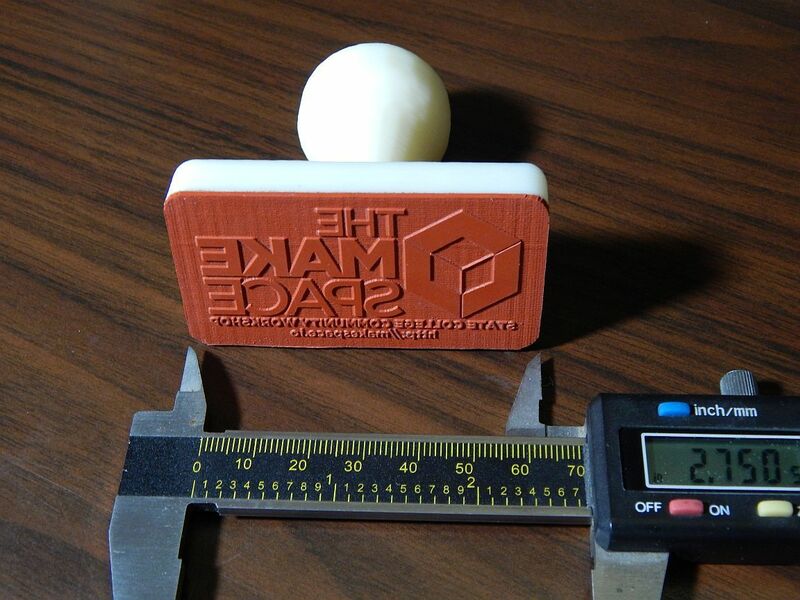 I sanded it with 400 grit sandpaper, so I need to bring it back in and try it on the pamphlets again. I can’t make it to the meeting tonight (Wed), but I do plan to stop by on Thursday. 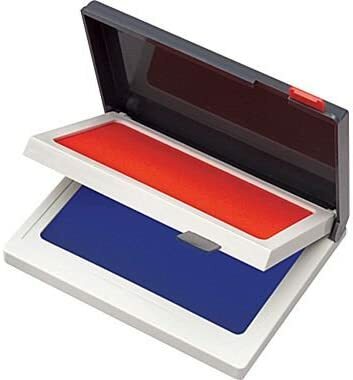 We have this 2-color Felt Stamp Pad in off-site storage.